Whoever heard of going to Italy for Golf! Spain yes, Portugal yes, America certainly, but Italy – really?! 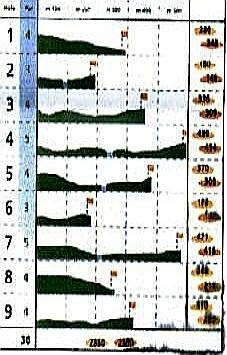 Yes, we can just hear you now, but you would be wrong. 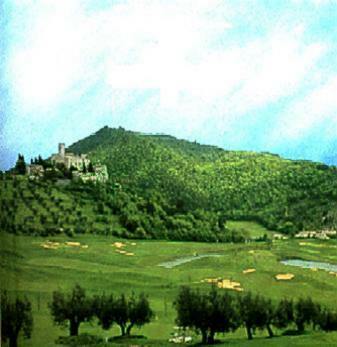 Golf in Italy is a fast growing sport but at the moment remains an unspoilt delight particularly if you are not quite in Tiger Woods’ League yet. Can you imagine deciding on the spur of the moment that you wanted to play golf, arriving at the golf course and being able to walk on to the course and play – well that is Golf around Lake Trasimeno in Umbria, Italy. Add to that having a satisfying round with challenging holes, wonderful weather and scenery (yes we know you are not supposed to look) and you have some idea what golf is like in our area. 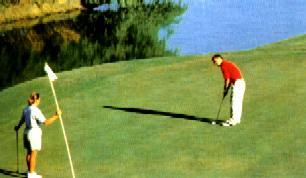 We are members of the Lambourgini golf Club, which is a challenging nine-hole golf course close to LakeTrasimeno. Within 25 kilometres there are two other Golf courses, Antognolla (27 holes) and Perugia (9 holes) and others are under construction. Non-golfing partners are not left out as they can take advantage of the swimming pools and restaurants at both Antognolla & Lambourgini. 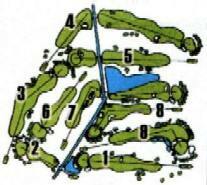 In addition to the 9 hole golf course (par 72 for 18 holes) there is a 20 position driving range, pitching & putting greens, practice bunker (all illuminated), 2 par three practice holes, well equipped locker rooms, a bar/restaurant, billiard room and a small pro- shop. The Pro and the Club Secretary both speak excellent English. There is a larger restaurant and 2 swimming pools (adult & childs) in the grounds of the adjoining agriturismo . Parachuting or an ariel trip round Lake Trasimeno. The Lambourgini estate is also famed for its wine ( the red is delicious) and you can purchase wine to take home or enjoy on your holiday from the nearby farm Cantina. Here you can also see and be photographed in one of the fabulous Lamborghini cars ( well you can but dream?). This club boasts both an eighteen hole, par 71, championship course which is quite demanding and a nine hole par 27 course for beginner/ improvers. Set among hills the courses are in an attractive setting and the club has excellent facilities – Club house, restaurant & bar, swimming pool, driving range, pitching & putting greens and pro-shop. English is spoken at the Reception desk. 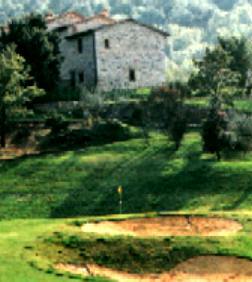 An eighteen hole par 71 course located on the outsirts of Perugia (district of San Sabina).